Random Thoughts of Gil Camporazo: Angelo Reyes, a Hero? By cutting off his life in a suicide just to save the military and even the Philippine Military Academy (PMA), his alma mater from shame because of military "pabaon" imbroglio, former AFP chief Angelo T. Reyes could be considered a hero? Former Armed Forces of the Philippines Chief of Staff Angelo T. Reyes was finally buried at heroes' cemetery Sunday 5 days after the breaking news of his self-inflicted death while he was visiting his mother's grave at Loyola Memorial park Tuesday. The incident took place while he was left by his two sons at his mother's grave. Surprised by the unexpected incident, his two sons rushed to him and right away brought him to Quirino's hospital for immediately medical attention. The doctors after several minutes of attending Reyes to revive him were hopeless. Reyes was declared dead. 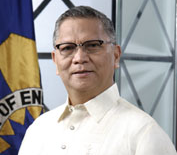 The retired chief of staff of AFP is currently Secretary of Energy the time he died. His ordeal began when he was embroiled by the corruption issue in the military, which allegedly involved the so-called send-off (paba-on) of a several-million-peso of money for the retiring chief of AFP by a whistleblower. An "independent journalist" said that before Reyes died, he had made a statement that his conscience is clear. He never invented corruption in his agency. He walked into it. It was a tradition. That's why as a well-respected, highly-regarded head of the entire armed forces of the Philippines, he kept up the noble expectations of his senior and junior military officers and even his fellow countrymen. "Sorry" was the last word his sons heard from Reyes before he died. He was remorseful that his whole family was affected and even his noble name was besmirched by smear campaign by "some of the people". He was terribly affected. He has sealed his integrity by his own blood before his beloved mother's grave! Did he die a hero?